After their silence on the People's Climate March, ask the Sunday shows when they think global climate change will be important enough to take seriously. 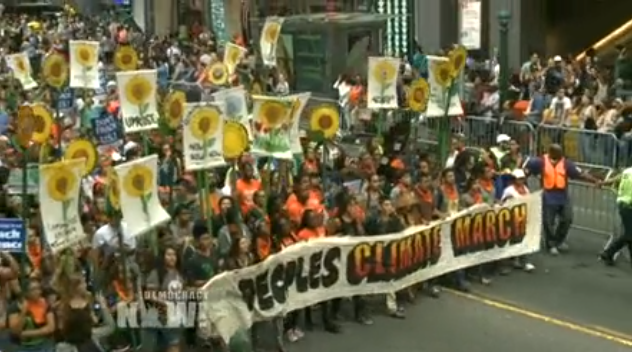 What People's Climate March coverage looked like on Democracy Now! If over 300,000 people march in New York City to demand action on climate change, does it make a sound? Not if you're watching the Sunday morning network chat shows. The September 21 People's Climate March lived up to its billing as the largest climate change march ever, drawing a massive crowd to focus world attention to the climate emergency. Similar events happened in other major cities around the world. Fairness & Accuracy in Reporting (FAIR), the national media watch group, has been offering well-documented criticism of media bias and censorship since 1986. We work to invigorate the First Amendment by advocating for greater diversity in the press and by scrutinizing media practices that marginalize public interest, minority and dissenting viewpoints. Sep 16, 2014 | Every week, the PBS NewsHour gives viewers its version of a left/right debate segment. On the right is well-known conservative pundit David Brooks. On the left is Mark Shields, who is not especially well-known outside of the NewsHour, and certainly has no meaningful connection to leftish politics. As FAIR (Extra!, 7/98) has noted, Shields' publicity materials used to proclaim that he was "free of any political tilt." On the most recent installment (NewsHour, 9/12/14), Shields was making the point that Congress should weigh in on any decision to launch military strikes against ISIS. Activism Director and and Co-producer of CounterSpin Peter Hart is the activism director at FAIR. He writes for FAIR's magazine Extra! and is also a co-host and producer of FAIR's syndicated radio show CounterSpin.